Yesterday we received confirmation from the German Air Force (GAF) that they will be sending a total of six aircraft to our static line up! Tornado lovers will rejoice as the GAF will be sending two examples of the jet from Tactical Air Wing 51. Following the retirement of the Royal Air Force's Tornado fleet, the opportunities to see the type in the UK are now limited. Visitors to our Park and View area will be able to see the Tornados arrive and depart, but we cannot yet confirm which day they will be joining us. 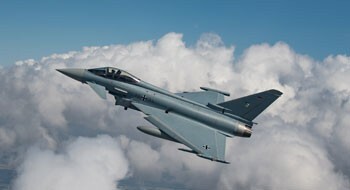 The GAF will also be providing three examples of the EF2000, (known to the RAF as the Typhoon), from three different units as well as an Airbus A400M tactical transport. This marks the first large European Air Arm update for the 2019 Air Tattoo and with over 110 days still to go there's time for much more!